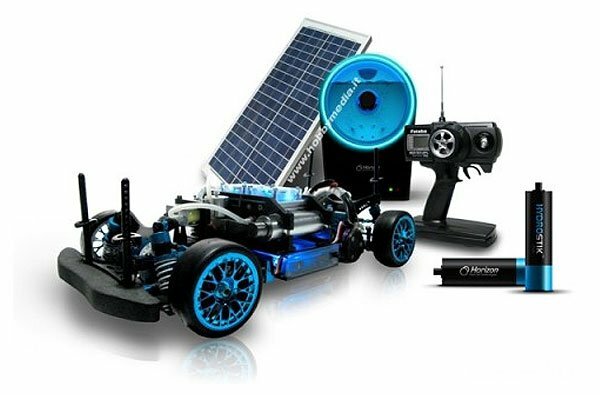 This prototype Hydrogen powered Hybrid Kit car has been designed around Tamiya’s TRF 416 carbon fiber chassis. Its HudroSTIks are able to carry 15Wh of energy or 13L of hydrogen and due to their positioning enhance the weight distribution of the kit. The Hydrogen is stored in two low pressure canisters containing a solid metal hydride matrix and the car is constructed from carbon fiber, aluminium and titanium components to keep weight to a minimum. Check out the video after the jump. As this Hybrid Hydrogen kit car is still in its prototyping stage at the moment we don’t have any information on availability or prices at the moment.